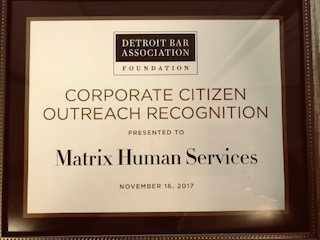 Kudos to Matrix Human Services for receiving Corporate Citizen Outreach Recognition from the Detroit Bar Association Foundation. The award was presented on November 16 at the Detroit Bar Association Foundation’s Dennis W. Archer Public Service Award event – which also honors legal professionals whose careers demonstrate an outstanding commitment to public service. This year, Mayor Mike Duggan joined ranks of Archer Award honorees. In addition to the award presentation, the Archer Award fundraising gala included a strolling supper, open bar and an opportunity to network and socialize with other legal and business professionals. Proceeds fund free legal clinics and community outreach programs. It was our pleasure, Matrix! We are thrilled with your well-deserved recognition!